When shopping for meat, the options are plentiful. Your butcher shop or the meat section of the grocery store is filled with different cuts of meat, in different shapes, and even different looks. From roasts to ground beef, you can find meat from every part of the cow or steer. But, when you are looking for a great, tender cut of grass-fed beef, it helps to have a little insight into what’s available. 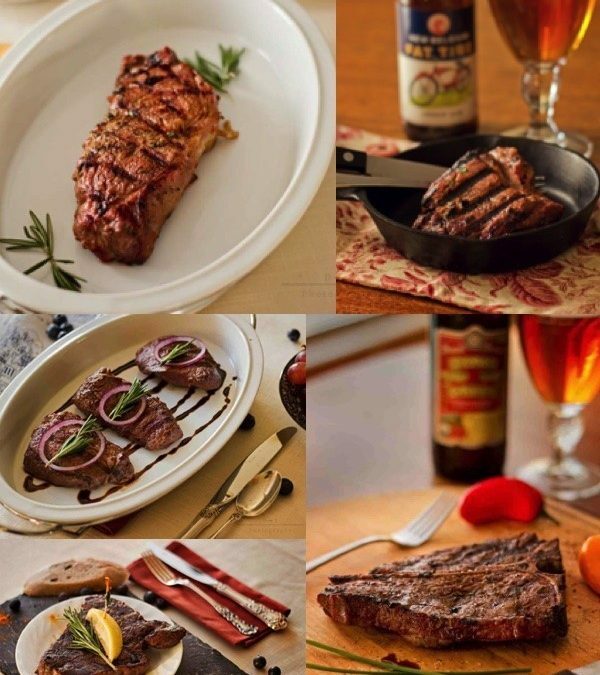 Here we’ll identify which are the most tender cuts of meat by highlighting four mouthwatering steaks. Each of these steaks comes from the same area or cut of the animal, the loin. One of eight primal cuts of beef, the loin is comprised of two sub-primal cuts, the strip loin, that runs along the spine; another is the tenderloin, which is smaller than the strip loin and runs parallel to and beneath it. Starting just behind the rib section, the loin makes up the most tender cuts of beef, which are typically the most expensive. These are the most expensive cuts of beef because relative to the entire animal, these premium cuts make up only a small percentage. If you are looking for a great tasting, tender, and flavorful cut of steak, it’s well worth the price. From the heart of the tenderloin section, the tenderloin steak is one of the most prized pieces of meat. The most tender of all cuts of beef, tenderloin steaks are lean and known for their delicate, butter-like texture and thick cut. These mouthwatering steaks are so tender they can be “cut with a butter knife.”Tenderloin steaks are commonly known as filets or filet mignon. Tenderloin meat can also be sold in roast-sized chunks, often used for chateaubriand. Cut from the front of the loin, the top loin is a well-marbled, very tender, juicy, and flavorful steak. The strip makes up the larger half of the T-bone steak. Also known as the New York strip or Kansas City strip, this piece of meat generally comes boneless and is closely trimmed of any fat around its edges. An American classic, the T-Bone offers the best of both worlds. This steak features a T-shaped bone with meat on both sides of it. On one side of the bone is the prized filet, which is the smaller of the two pieces of meat in this steak. On the other side is a juicy New York strip. The bone adds to this well-marbled cut of beef’s hearty flavor. Extra thick and juicy, the “king of all steaks” is filled with amazing “bone-in” flavor. Similar to the T-bone, the Porterhouse also features a T-shaped bone, except the filet side is a larger and thicker cut of tenderloin. This is a big steak, perfect for those with hearty appetites. Are you are wondering how tender cuts of meat should be cooked? Because these tender steaks come from an area of the animal where the muscle wasn’t exercised as much as the flank or round primal cuts, it doesn’t contain as much of the connective tissue that generally extends cooking times. For the most part, these four steaks can be seared on each side, and are generally enjoyed medium rare to savor the juicy flavor of the meat. Grilling and broiling are popular cooking methods for these steaks, but it’s also not uncommon to cook them on a skillet. While you can marinate these steaks, to truly experience the full flavor, a little salt and pepper or steak seasoning is really all you need.